Armed with only a sword and shield, a gift from Aduro the wizard, Tom must duel with Arcta the fearsome mountain beast. The fate of Avantia’s magical beasts lies in Tom’s hands. But does he have the skill and courage to save his land from destruction? A book for you IF you like fantasy fiction! I thought this was the best so far and I thought it was good that it was a beast no one would usually think of. this is by far the best book in seies 1. It was OK ,not me. Arcta has the same age as Rokk the Walking Mountain. I Collect Beast Quest Cards. This book was fantastic! Loved it I have got the whole series a month ago and i’ve read it already! I loved this book i read it in a day espcialey the monster. 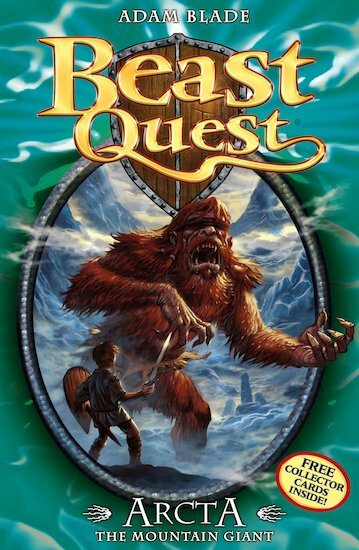 This book is is my second favourate book because it was set in the mountain range, it is about a giant, and it has really good describing words. Another great book in the first series… excellent. This book is really exiting and knowone knowswhat will happen next!I reccomend this book to anyone. It is really exciting and grips you to read more.